MIDTOWN, Manhattan (WABC) -- The New York Knicks lifted their ban on former player Charles Oakley on Tuesday, sources told ESPN's Stephen A. Smith and The Undefeated's Mike Wise. A source within the Madison Square Garden organization told Smith of the move, while Wise was informed by a source close to Oakley. The news comes after NBA commissioner Adam Silver said he and Michael Jordan spoke with Oakley and Knicks owner James Dolan on Monday to help end the public dispute between Oakley, one of the franchise's most popular players, and Dolan. Oakley was forcibly removed from Madison Square Garden and subsequently arrested last Wednesday. 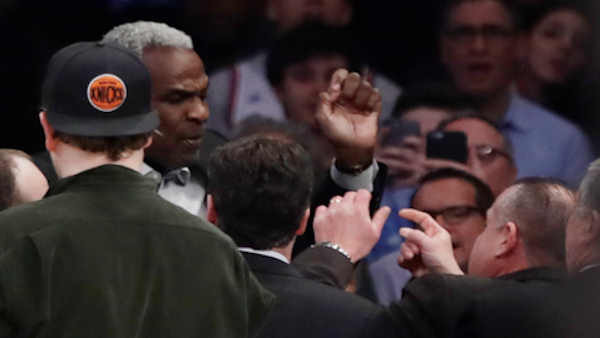 After the arrest, Dolan announced that Oakley was banned indefinitely from the Knicks' home arena. Oakley was charged with three counts of misdemeanor assault and one count of misdemeanor trespassing. Dolan said the organization ejected Oakley because he was being verbally abusive to security while seated near the team owner. Oakley denied this in recent interviews. After the incident, Dolan also suggested in multiple media interviews that Oakley has a drinking problem, which Oakley denied on Saturday in an interview with the New York Post. Oakley and Dolan met with Silver at NBA headquarters, with Jordan participating by phone, the league said in a statement. It said both Dolan and Oakley apologized for the fallout from Wednesday's situation. "Both Mr. Oakley and Mr. Dolan were apologetic about the incident and subsequent comments, and their negative impact on the Knicks organization and the NBA," Silver said. The statement had said that Dolan hoped Oakley could return to MSG as his guest in the near future. The Knicks and Dolan have received criticism for the decision to ban Oakley and the public suggestion that he has a drinking problem. On Monday, the Rev. Al Sharpton called on Dolan to immediately lift the ban against Oakley. In a statement, Sharpton said that in the event that the ban were not lifted, his National Action Network would organize a group to picket outside of Madison Square Garden.